We are bubbling over with Prosecco and excitement here! For the second consecutive year, our wine program is being recognized by Wine Spectator. In 2016 we received the Best of Award of Excellence and we have maintained that level again in 2017. Ristorante Verdicchio | Enoteca will be listed in the Aug. 31 2017 Restaurant Awards issue, one of very few restaurants in Northern Ontario to receive the award. Each year Wine Spectator presents nearly 3,600 restaurants from 75 countries around he globe that have earned distinction for wine-list excellence. When we opened a 20-seat Italian restaurant in 1994, we served the classics like Chianti Ruffino and Amarone Valpolicella. Then, we started introducing hard-to-find varietals, wine not available at your local LCBO, some real hidden gems. By meeting face-to-face with Italian winemakers, working with wine agents, tasting, tasting and more tasting, we were able to expand our wine list to feature one that now boasts 400 varietals. And a big thank you to our customers who have supported our growth and ….enjoyed a glass of vino or two with us over the years! These wine lists display excellent breadth across multiple winegrowing regions and/or significant vertical depth of top producers, along with superior presentation. Typically offering 350 or more selections, these restaurants are destinations for serious wine lovers, showing a deep commitment to wine, both in the cellar and through their service team. 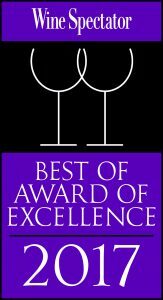 Our highest award, given to restaurants that show an uncompromising, passionate devotion to the quality of their wine programs. These wine lists typically feature 1,000 or more selections, and deliver serious breadth of top producers, outstanding depth in mature vintages, a selection of large-format bottles, excellent harmony with the menu, and superior presentation. These restaurants offer the highest level of wine service. Have a favorite restaurant wine list that we’ve missed? Let us know here. Wine Director/Sommelier: This information, provided by the restaurant, indicates the people responsible for managing the wine list and assisting diners with their wine selections. Wine Strengths: Determined by our judges, this indicates the emphasis of the list, not all the regions from which wines are offered. Wine strengths are listed in descending order of prominence. Wine Selections: This indicates the number of selections on the list at the time the award was conferred. For Grand Award winners, this is followed by the total number of bottles in the restaurant’s inventory. Wine Pricing: Determined by our judges, this describes the overall pricing of the wine list, taking into account both the general markup of wines offered and the number of wines at high and low price points. Inexpensive lists offer many bottles for less than $50, while also exhibiting a below-normal markup (generally considered to be two to two-and-a half times the wholesale bottle price). These lists offer uncommon value. Moderate lists employ the industry norm for markup, with a range of less expensive and expensive bottles. Expensive lists offer wines priced with a greater-than-normal markup, along with many selections for more than $100 a bottle. Pricing is not a judging criterion, it is merely provided as a guide for the reader. Corkage: Provided by the restaurant, this reflects the corkage fee charged per bottle to customers. Corkage fees are typically charged per 750ml bottle; expect to pay more if you bring a magnum. Some restaurants do not permit diners to bring their own wine; others are prohibited by state or local regulations. Some readers report discrepancies between our listings and actual practices at the restaurants. If you plan to bring wine to a restaurant, always call ahead to confirm its corkage policy. Cuisine Type and Menu Pricing: Cuisine type is provided by the restaurant, indicating the style of food served, and menu pricing is determined by our judges. The pricing categories are based on what a typical guest would pay at dinner for a two-course meal. Price does not factor in tip or beverage costs. The categories are defined as follows: Inexpensive is less than $40, moderate is $40–$65, and expensive is $66 or more. For restaurants that offer only a prix fixe menu, the specific price is indicated, based on information provided by the restaurant.